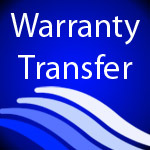 Purchasing the warranty transfer will transfer the remainder of the original warranty period of a FLEX-6000 SDR or Power Genius XL to a new owner. This is not an extended warranty. The warranty period start date is determined by the radio's manufacturer date. For the FLEX-6700, FLEX-6600, FLEX-6600M, FLEX-6400, FLEX-6400M, FLEX-6500, FLEX-6300 and Maestro it is the first 4 numbers of the radio's serial number. This is known as the manufacture date information component of the serial number. To determine the radio's manufacture date, The first two digits of the manufacture date information is the week of the year (1-52) and the last two digits are the year of manufacturer. Example: if the manufacture date information is "1511" the manufacturer date of the radio the 15th week of 2011. The end date of the warranty period is two (2) years after the manufacturer date for the FLEX-6700, FLEX-6600, FLEX-6600M, FLEX-6400, FLEX-400M, FLEX-6500, and FLEX-6300 and one (1) year for the Maestro.